When it comes to the world of tablets, it cannot be denied that the iPad wins hands down compared to the myriad of competitors out there. You hardly see lines forming to pick up the Motorola XOOM, and neither did everyone become super excited concerning the BlackBerry PlayBook (and for good reason, too – that model had some spiffy looking hardware, but when it comes to the software bit, it does tend to disappoint for the moment). 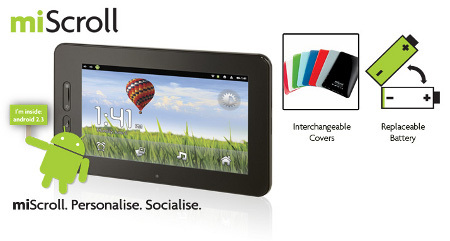 Well, there is another tablet that has just entered the fray, looking to target the under 25s market. Storage Options is the company behind the miScroll tablet, where it is touted to be the worlds first personalized tablet for the age group mentioned (under 25s). It will retail for £119.95 a pop, and is actually the 4th addition to the Scroll family, making it the only tablet in the world that will sport a replaceable high capacity battery – perfect whenever you are on a long journey without any power outlet in sight, although the iPad’s battery life can be said to be more than just average in its defense. Other hardware specifications of the miScroll include 4GB of internal memory, the ability to change its covers with many colors to choose from, distinctive designs to help you stand out from the rest of the crowd, a 1GHz ARM11 processor that is powered by the Android 2.3 Gingerbread operating system (although we would have liked to see Android 3.0 Honeycomb instead) alongside a built-in camera that allows you to capture your favorite photos without missing a beat. Tipping the scales at a mere 370 grams, it will function as an excellent portable multimedia hub courtesy of a built-in mini HDMI port for Full HD output (1080p), alongside a mini USB port to make sure you can connect other peripherals including a keyboard or perhaps a powerful sound system. At least you can pick up replacement batteries and covers if the former starts to die off, where you can purchase those for £19.99 while covers go for £14.99 a pop. Any takers so far? More info available over at Storage Options.